Recently, Indian Prime Minister Mr. Narendra Modi announced that India had become the fourth country in the world to demonstrate anti-satellite (ASAT) capability after the United States (US), Russia and China. In the reams of media analysis that followed, very little context was given to understand the significance of this development. This article therefore will serve as a backgrounder for those who wish to understand the very basics of ASAT weapons and their significance. To begin with, let us start with the Earth’s Atmosphere itself and the issue of delineating it from what we call ‘Space’. 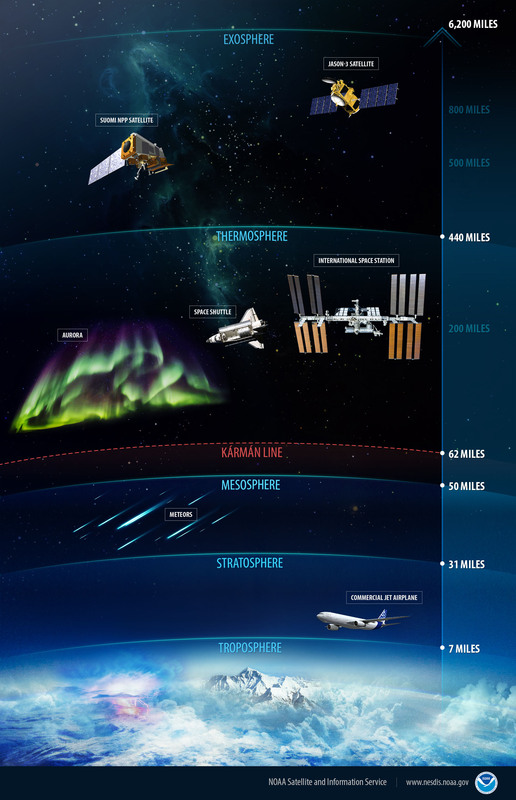 As we can see in Fig 1. above, the Earth’s atmosphere has five layers – Troposphere, Stratosphere, Thermosphere, Mesosphere and Exosphere. These atmospheric layers have no distinct boundaries but are approximately definable. 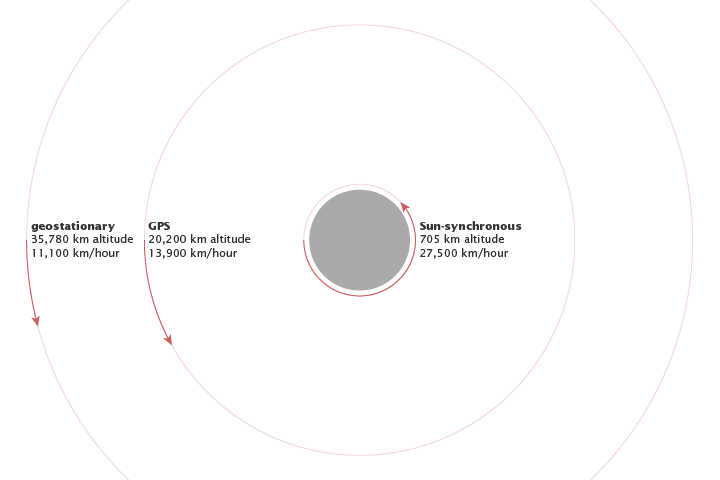 The region beyond the Exosphere extending up to the orbit of the Moon, which is at an average distance of 384,403 km from the Earth, is called Cislunar Space. Beyond Cislunar Space lies what is generally known as Deep Space. The upper boundary of the Troposphere ranges from 8 km above the poles and up to 20 Km over the equator. We live and breathe in the planetary boundary layer, which is the lowest part of the troposphere. At an altitude of around 18-19 km is the Armstrong Limit, above which humans need a pressure suit to survive. Above the Troposphere is the Stratosphere which extends up to an altitude of 50 Km. This layer is ozone rich and shields the Earth’s atmosphere from harmful solar radiations and is a heat trap to keep the Earth warm. Air here is very dry and very thin. Low air resistance makes the lower reaches of the Stratosphere ideally suited for commercial airliners to fly in. The Mesosphere extends from 50 Km to about 80 Km. Here temperatures dip to minus 90 degrees centigrade (°C) in the outer periphery. In this layer most meteors get burnt up. The air has too little oxygen for jet (gas-turbine powered) aircraft to fly in. At an altitude of 100 km above the Earth’s surface lies what the Fédération aéronautique internationale calls the Karman Line and for the purposes of convention marks the end of what is called Near Space and the beginning of Outer Space. The Karman Line is important, because it is used by various space-related treaties for the purposes of record keeping. Thus, the Stratosphere, Mesosphere and lower Thermosphere up to the Karman Line constitute ‘Near Space’. Near Space is essentially the band above the ceiling limits of jet powered aircraft but below that of orbiting satellites and is usually considered to begin at an altitude of 20 km. It is also referred to as the Death Zone. Incidentally, the Karman line is named after Theodore von Karman, who had sought to determine the altitude at which the atmosphere becomes too thin to support aeronautical flight. The next layer, Thermosphere, extends up to about to an altitude of about 700 Km. Here temperatures shoot up to 1500°C. Though considered as part of the Earth’s atmosphere, the air density is so low that it is treated as Outer Space. The International Space Station orbits Earth in this layer. It is in this layer that the phenomenon of Aurora Borealis and Aurora Australis are observed. Beyond this is the Exosphere where the Earth’s atmosphere merges into Cislunar Space. Military commanders always want to ‘look over the hill’ and crave ‘precision’ firepower. In the troposphere one uses manned / unmanned aircraft for this purpose. However, the efficacy of aircraft is bound by their footprint; which in turn is dictated by the height and speed at which they fly. The higher they fly, the larger the footprint. The faster they fly, the footprint transits faster while enabling greater area coverage. The longer they endure the better the stability of operations. All in all, manned aircraft or unmanned aerial vehicles (UAVs) can overcome problems related to area coverage, endurance, sensor accuracy, energy, persistence, detectability and vulnerability to an extent only. They lack an ability to ‘stay and stare’ like artificial satellites can. This implies that one must go higher towards Space. While Near Space would have been the logical next step, powered flight isn’t exactly easy over there. For instance, the highest altitude that a military UAV has been known to attain is some 19 km by the American RQ-4. Of course, in 2017, there were reports that the Chinese had tested a spy drone capable of flight at an altitude of 25 km. Stratospheric airships or so-called stratellites are a continuing area of research as well. Be that as it may, one must go beyond the ‘Death Zone’ to get the ability to ‘stay and stare’, as of today. For example, one can cover all of Afghanistan or Pakistan or Tibet in one look from Space. Such persistence and coverage can be achieved in Space only by a well-designed Low Earth Orbit (LEO) constellation or distant Geostationary Earth Orbits (GEO). It is therefore time to briefly take a look at various satellite orbits and their characteristics. Satellites can be classified as being in LEO, Medium Earth Orbit (MEO), GEO or High Earth Orbit (HEO) based on their distance from earth. Orbits could be equatorial, polar or inclined. Orbits could be circular or elliptical. Each orbit is suited for a purpose /application and coverage area. Fig 2. below depicts various kinds of orbits. Fig 2: Various kinds of Earth Orbit based on their broad characteristics. There are obviously specific cost implications for each type of orbit. For the purposes of this backgrounder, we will however consider only circular orbits. Nonetheless, the simplest way to understand the varied roles satellites play is to look at their orbit based on the distance at which it is located from the Earth. LEO lies between 160-2000 km above the Earth. It is the kind of orbit easiest to access. There are more than 800 LEO satellites in space, including ISS and the Iridium network of communication satellites. Orbital velocities of LEO satellites are about 7.5 km/s (27,000 km/h). Orbital time period around the earth is between 90-120 minutes. LEOs need lesser power and lower grade sensors for communication and imaging compared to satellites in higher orbits. LEO satellites are best suited for detailed imagery. They are easy to build and launch. Replacement times are quick, and effort is easier. All CubeSats (miniaturized satellites) are in LEO. However, LEO is a crowded orbit where space debris is an issue. LEO satellites have a short lifespan. Most military satellites are LEOs and are vulnerable to Earth based ASAT Weapons as has been demonstrated quite a few times now. MEO is also known as the Intermediate Circular Orbit and extends from 2000 km to right below 35,786 km. MEO satellites have an orbit period between 2-24 hours. This orbit is primarily used for communication, navigation (examples include Galileo and Glonass systems), and to provide a gravity-less environment for scientific experiments. Due to increased height, propagation delays creep in and power requirements increase. This drives up costs. Lifespans are lesser as compared to a satellite in GEO because MEO lies in proximity to the Van Allen Radiation Belt, a region(s) of highly charged particles maintained by the Earth’s magnetic field, which degrades the performance of satellites. Satellites in this orbit appear stationary from Earth. The orbit is at a precise altitude of 35,786 km, circular, directly over/ oscillating over the equator and revolves in the same direction as the direction in which the Earth rotates i.e. West to East. It is also known as the Clarke’s Orbit, so named after Arthur C.Clarke who first proposed a satellite based communications system using GEO. All GEO satellites have an orbital period equal to Earth’s rotational period i.e. 24 hours. The major benefit of this orbit is the fact that Earth stations and the satellite are fixed in relation to each other and the coverage area from this altitude is pretty good. However, the cost of launching a satellite into GEO is high. Increased distance from Earth stations implies a lag in communication. Signals require more power. This increases the cost further. Its main uses are in direct broadcast TV, communication networks, defence and intelligence applications and global positioning or GPS – which is used for satellite navigation systems.The Indian Regional Navigation Satellite System constellation is also parked in this orbit. Any Earth orbit beyond GEO is known as HEO. Satellites in high earth orbit have orbital periods longer than 24 hours. Satellites appear to be moving backward / heading in the opposite direction since the Earth rotates at a faster speed. HEOs are useful to study our planet’s magnetosphere and for other astronomical observations. The most common missions for military satellites are communications, command and control (C2), intelligence, reconnaissance and surveillance (ISR), signals intelligence (SIGINT), positioning, navigation and timing (PNT), meteorology, space-based missile tracking and satellite tracking. Satellites can also be used as platforms for space-based weapons. Unsurprisingly LEO is the most sought-after orbit to park and operate a military satellite from for the reasons delineated above. Of course, GEO is also used for military purposes. Now, LEO satellite transmissions are in real time and are an important part of the command and Command, Control, Communications, Computer, Intelligence, Surveillance, and Reconnaissance (C4ISR) architecture of any networked-enabled or network-centric military. As such, LEO satellites are currently prime targets for ASAT systems. An ASAT weapon is designed to destroy or incapacitate satellites. ASATs are divided into two broad categories- direct ascent (DA) and co-orbital (CO). DA systems are missiles that can be launched from land, air or sea at satellite targets in LEO. As of now, only the United States (US), Russia, China and India have all successfully tested DA systems. In addition to ground-based launchers, airborne or ship borne systems can also be used for launching ASAT missiles. At present, only the US has successfully demonstrated the capability to knock out a satellite in LEO using a missile launched from a surface ship in the course of Operation Burnt Frost in 2008. During the Cold War years, the US also demonstrated air-launched DA capability, with the last such demonstration taking place on 13 September 1985, when an ASM-135 missile launched from a F-15 fighter was used to complete the successful intercept of a satellite in LEO. Though, Russia may also possess air-launched DA ASAT capability, initially developed during the late Cold War, but at the moment seems to be focusing on a ground-launched system. Russia, China and India have all publicly demonstrated only ground-launched DA ASAT capability till date. Though the after-effects of the 1962 Starfish Prime high-altitude nuclear test by the US, showed how high-altitude nuclear explosions could be used to create a belt of ionizing radiation to destroy orbiting satellites, no country is known to have developed an actual weapon using this principle. Earlier US high-altitude nuclear tests had already shown the potential for using nuclear electromagnetic pulse (NEMP) for disabling satellites. But again, no EMP- warhead using DA ASAT missile is known to publicly exist. CO ASAT or space-based capability has been explored since at least the 1960s. The Soviets pioneered the Istrebitel Sputnik or ‘Fighting Satellite’ program, which led to other follow-ons during the course of the Cold War. Several US CO ASAT concepts also emerged in the course of the Regan-era Strategic Defense Initiative Program. At the moment, neither the US nor Russia publicly declare an existing CO ASAT system. Overall, as a former artillery officer, while I laud India’s ASAT demonstration, I believe that more work lies ahead to refine the C2 setup for co-ordinated multiple launches and developing a military doctrine for their use. In an environment where satellites in LEOs are operated in constellation, one must destroy more than one satellite to get a desired effect. Countries are also developing the ability to launch a LEO satellite on a quick reaction basis to plug gaps due to ASAT actions. It is a cat and mouse game and a lot lies ahead. Lieutenant General P.R Shankar (retd.) is a former Director General of the Indian Army’s Artillery Corps.